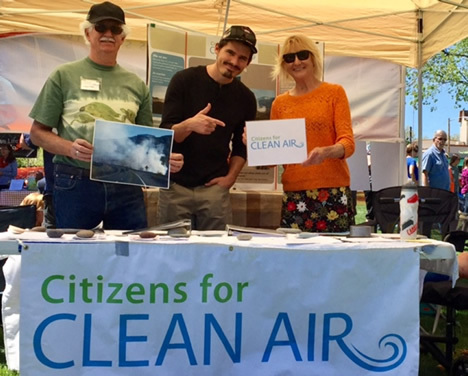 Learn more about the Citizens for Clean Air in Grand Junction, Colorado. A Western Slope where citizens work with government agencies, non-profits, and the private sector to promote clean air. To research and reduce air pollution and promote improvement of air quality in Mesa County and the Western Slope through grassroots involvement with local, state, and federal efforts. CCA is an organization located in Grand Junction, Colorado. We are volunteers concerned with how air quality effects the health and welfare of residents in Grand Junction and beyond. We were formed in January 2013 after a frigid, snowy winter in the Grand Valley creating a severe air inversion that caused lingering air pollution for several months. Karen Sjoberg gathered several concerned citizens, some of whom experienced health consequences from the pollution, to discuss what they could do as a group to raise awareness of the issue and work toward improving the air. testimonials at public meetings where decisions are made on air quality rules and regulations, including local, state and national public hearings. organized attendees to provide testimony for a public hearing at Colorado’s neighboring Utah Department of Air Quality, which resulted in standardizing Utah’s oil and gas permitting process (2017).